Growing up, we had a tradition of Sunday grilling. My dad absolutely loves to create different types of marinades and rubs for meat and even cook all our veggies on the grill as well. With Father’s Day coming up, I wanted to take some of my childhood memories and celebrate them with my dad this Sunday by having an open grill. Kabobs have always been a favorite of both of ours, so I’m creating a recipe for pork kabobs with grilled corn. Instead of using olive oil in my marinade and butter on the corn, I’m going to be replacing both with coconut oil. 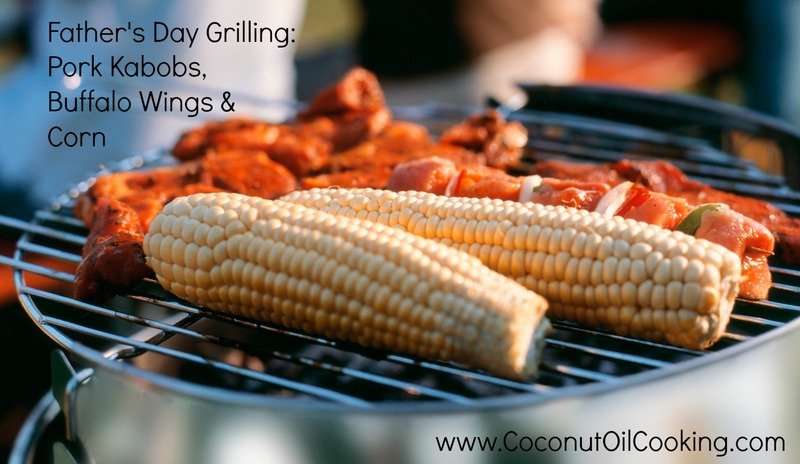 I personally love how coconut oil enhances the flavor in the marinade and also gives a subtle nutty sweetness to the corn. In a medium size bowl, whisk together coconut oil, aminos, garlic, mustard, salt, and pepper. Next, place the pork pieces into the bowl, turning each piece to get coated with the marinade. Cover bowl with plastic wrap and place into the refrigerator for at least one hour. Once time is up, take pork pieces from the bowl and transfer them onto a cutting board or plate. To put the kabob skewers together, alternate with a pork piece, red bell pepper, onion, and green pepper until the skewer is completely full. Preheat your grill to a medium-high heat and lightly oil the grate if needed. Place on grill for around 15 minutes, along with the corn, alternating until thoroughly cooked. Once finished, remove all kabobs and corn from the grill. 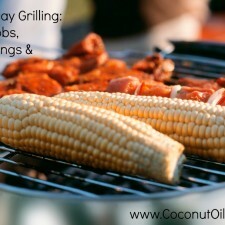 Rub desired amount of coconut oil over the warm corn and serve. I’m telling you, the taste of coconut oil and warm corn is amazing – make sure to give it a try. I also deiced to use Jen’s recipe for Buffalo wings and will throw some on the grill as well. You can never have enough good food, especially on Father’s Day! Feel free to add additional spices to the marinade such as ginger or any of your favorites. The Bragg Liquid Aminos are a great replacement to soy sauce, being that it contains much less sodium, so this was my personal preference. Regular soy sauce may also be used instead. Of course we can’t forget about dessert, so I’m also going to whip up some of Chef Alyssa’s Cacao-Coconut Truffles as a chocolaty treat. Sign up here to receive recipes in your inbox.